So, when you pick up an autobiography by John Cleese, of Monty Python fame, you might expect to read quite a bit about Python. Well, let me tell you now, that most definitely is not what you will find in this book. So, if that is the one and only thing you wanted to hear about, well, maybe this is the book for you. However, for those of you with a sense of adventure, I would encourage you to pick it up and give it a read anyway. This would basically be the story of Pre-Python Cleese, which is still quite an interesting story. Just pretend you are reading about someone that wasn’t a part of the Monty Python cast and then maybe you will find the great bits and pieces. John Cleese’s huge comedic influence has stretched across generations; his sharp irreverent eye and the unique brand of physical comedy he perfected with Monty Python, on Fawlty Towers, and beyond now seem written into comedy’s DNA. 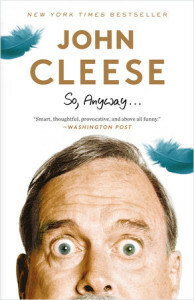 In this rollicking memoir, So, Anyway…, Cleese takes readers on a Grand Tour of his ascent in the entertainment world, from his humble beginnings in a sleepy English town and his early comedic days at Cambridge University (with future Python partner Graham Chapman), to the founding of the landmark comedy troupe that would propel him to worldwide renown. Cleese was just days away from graduating Cambridge and setting off on a law career when he was visited by two BBC executives, who offered him a job writing comedy for radio. That fateful moment—and a near-simultaneous offer to take his university humor revue to London’s famed West End—propelled him down a different path, cutting his teeth writing for stars like David Frost and Peter Sellers, and eventually joining the five other Pythons to pioneer a new kind of comedy that prized invention, silliness, and absurdity. Along the way, he found his first true love with the actress Connie Booth and transformed himself from a reluctant performer to a world class actor and back again. Twisting and turning through surprising stories and hilarious digressions—with some brief pauses along the way that comprise a fascinating primer on what’s funny and why—this story of a young man’s journey to the pinnacle of comedy is a masterly performance by a master performer. The book starts, well, at the beginning, with Cleese’s early life and schooling. There are lots of pictures, which I always enjoy in a biography. The story follows how Cleese got his start in comedy and writing and there are lots of great stories involved. You can definitely “hear” Cleese’s voice as you are reading the book. It was interesting to learn about all the British TV shows that Cleese was a part of and also his stint on Broadway. I have to admit that I hadn’t heard of most of the shows he mentioned, but that is probably due to the fact that, a) I wasn’t alive and b) I’m from America. And while the book does not focus on the Python years, we do learn how some of the sketches got their start, and of Cleese’s writing partnership with Graham Chapman. Since there was only slight mention of Python, A Fish Called Wanda, and Fawlty Towers, MAYBE we can expect a second book? It wasn’t hinted at, but one can hope, can’t one? Cleese’s first wife Connie was mentioned, and he does mention having other wives in the future, but there is no discussion of them, and it would be nice to hear more about that aspect of his life. I didn’t realize when I started reading that there would be lack of Python info, and was surprised the further I got that we hadn’t gotten there yet. The very last chapter does have a little info, but is actually more about the recent reunion. So that aspect is a little disappointing, but, as I said, it’s still an interesting and humorous read. For more information, check out Cleese’s Author Page and the book page at Penguin Random House, which includes an excerpt and some interviews. I received this book from Blogging for Books in exchange for my honest review.